A Gold Award winning, record breaking summer! Wow – what a summer! According to the Met Office, summer 2018 could rank as one of the 10 hottest summers on record. We can believe that! Our pretty roof terrace at the Kings Road showroom is home to Manutti’s Zendo corner garden sofa – and it’s been receiving plenty of visits! 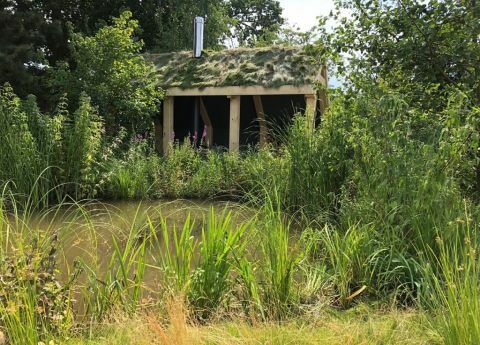 We lost it for a few days however as the garden design team behind a Show Garden at the recent RHS Hampton Court Palace Flower Show asked if they could borrow it. We were delighted and, guess what, the garden won a Gold Award! 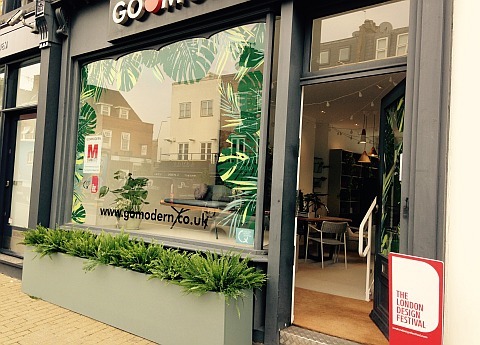 Turning The Indoors Out.. and Go Modern turns 10! Well, apologies for our break in transmission… its been a busy few months! For the whole of the London Design Festival in September, Go Modern discovered its green fingers, as we transformed our Kings Road showroom into a ‘magical outdoor garden sitting room – inside’ to showcase the very latest of our luxury outdoor furniture from Belgian manufacturer Manutti. We were also celebrating a very special anniversary as Go Modern turned 10! The August issue of Homes & Garden’s (out now) is a special treat this month. A whole section on ‘Outdoor Rooms’ with lots of superb styling tips from Kate French and Ali Brown. They talked about multi-functional furniture and upholstered sofas, all designed for outdoor use but looking good enough to house inside. 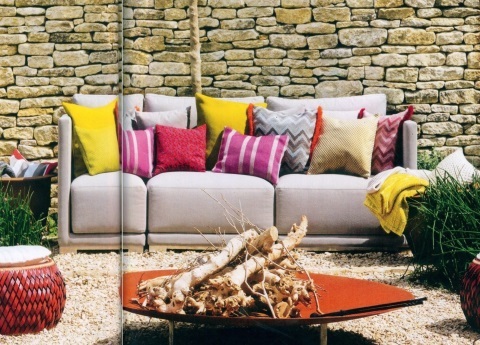 Sofas layered with colourful cushions, made from all weather fabrics, and woven stools that can double as tables. Bonaldo Big Table strikes again! We’ve always been very press friendly at Go Modern. Our showroom isn’t huge but we have a number of stand-out pieces from our top manufacturers, along with fabric samples, wood, glass, lacquers and weaves if it’s garden furniture. So, when the team at House & Garden asked if they could borrow our Big Table from Bonaldo for a shoot we were happy to oblige. 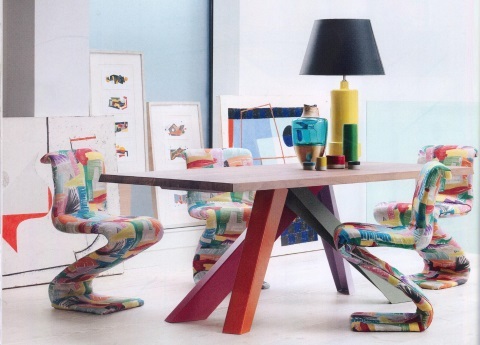 The Big Table by ultra talented designer Alain Gilles is a favourite, so we’re always ready to do a little showing off with it! This one is in canaletto walnut with striking coral red, orange, green and lilac lacquered metal legs – a real show-stopper. And the talented styling team at House & Garden included it in their great July feature ‘Block works’, using abstract prints and primary colours , mixing mid-century design with contemporary. It looks terrific – what do you think? We love the Milan Furniture Fair – its absolutely enormous, & right at the cutting edge of the market. If its going to happen, it will happen here. We visited all of our wonderful contemporary furniture suppliers, several of whom presented shiny new collections that are actually ready to buy now! 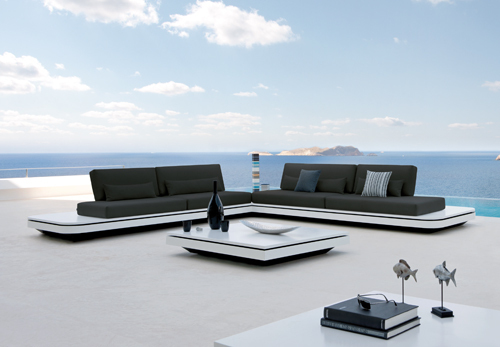 First up is Manutti Outdoor Furniture. We sell an awful lot of Manutti furniture (we are their largest UK dealer) & have been working with them for a few years now. New for 2013 are several collections. First up is Elements, a sleek white modular collection with option LED lighting. The top plate is quartz composite, the cushions are magnetically attached to the backrests, & the backrests can be adjusted.